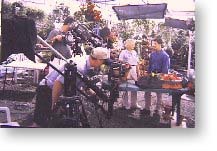 I'm the Director of Photography on ABC TV's EMMY Award winning Better Homes and Gardens Show. The MICRODOLLY Jib has really come in handy because it is so light and quick to set up. We can put it together in just minutes and that's made my job so much easier. The lightness is really important because we travel a lot. It's quick and fast and the crew loves to work with it because it gives us those quality moving shots that give us the edge over other shows. 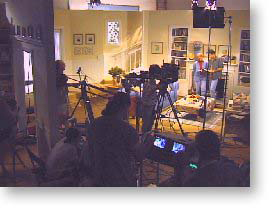 For a show like this where speed and quality are important both in the studio and on location the MICRODOLLY Jib is really valuable. It travels in less space than a tripod. We usually just put it in the overhead compartment when we fly. The Jib also works perfectly with the MICRODOLLY Camera Dolly and Track System. It's a great combination that lets you do a beautiful tracking shot and crane move together and you don't have to carry weights to the location since the Jib can use anything for counterweight, even water, in its folding weight cage. This kind of camera movement really increases the production value of the show. As the D.P. it's made my job much easier and gives me a great look. And my producers love it.